Today we’re looking at hand marker gets its name from a playground ladder that is nearly impossible to climb. 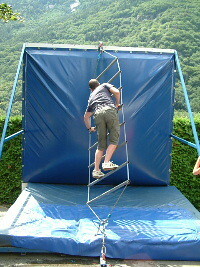 The ladder flips over because it’s attached top and bottom to a ring. Some people can’t make one step before falling off. Others get nearly to the top before their hopes are dashed. The name originally comes from a biblical story – the ladder Jacob dreamed of, from Earth to heaven. Angels attempting to ascend kept falling off the ladder and back onto Earth. Richard Unger named the hand marker shown below after this playground ladder. It’s quite hard to see this marker on the hand itself but it shows up really well on hand prints. 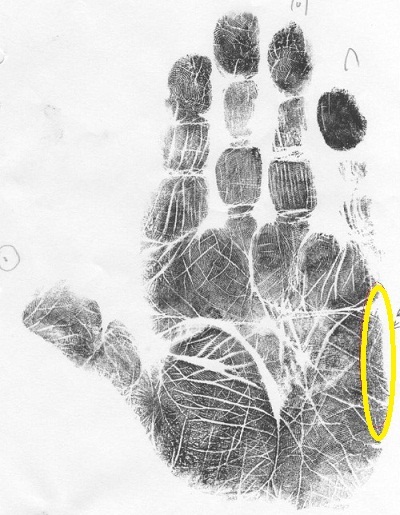 The marker is on the outer edge of the palm, slightly curved, like a bite mark. The key to this marker (and it’s resolution) is where it lies on the hand – it is as far away from the thumb as any marker can be, and the thumb is about taking action. Unger says the Jacob’s ladder is an indicator of extreme yin energy, deep feelings of self torment without taking action. I have spoken to numerous people with this marker and in all cases this description was accurate. Often these feelings are caused by isolation, whether self inflicted or not. I see this marker fairly often among the Expat community in Switzerland. When I talk to people who have this marker I ask them about their “dark night of the soul” and they understand immediately what I am talking about. As I said earlier, the thumb is the key; taking some form of action besides self torment. Find someone you can phone or reach out to who can be present to whatever is going on, and find a path towards higher guidance, such as Esther Hicks’s daily appreciation prayer or Phyllis Krystal’s Maypole exercise. 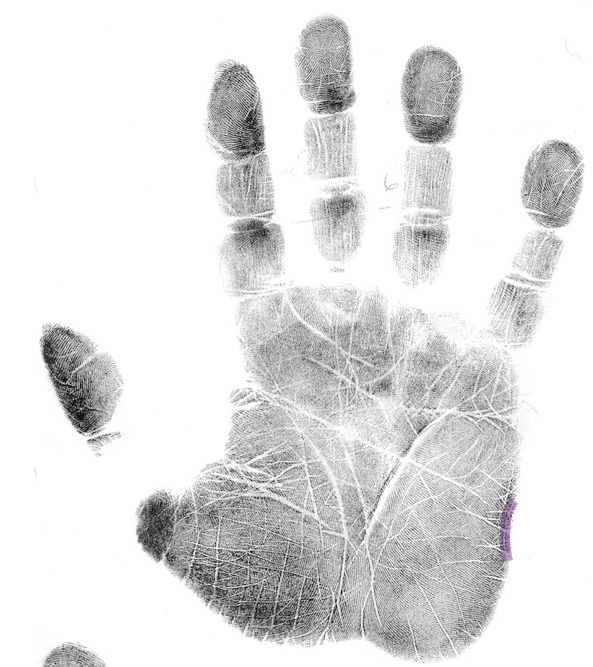 And consider having your hands analyzed for a deeper understanding of your purpose and potential. ” The inner voice is very strong and dominating. But in this case the inner voice gets very helpless, powerless, overwhelmed and feels trapped by the circumstances of life and there’s nothing I can do about anything…. That’s why I use the term Jacob’s ladder because everything seems impossible to the owner of this…. The positive side of this marker is that climbing this ladder is actually possible, albeit extremely difficult. If one can master it, that’s like ascension. Consider it a massive personal growth opportunity. 2 comments to Dark night of the soul – is ascension possible?